In some ways, with Little H we seem to have had one set back after another. We started off thinking everything was fine and then, often suddenly, things would take an unexpected turn for the worse. Little H having his first cuddle in the neonatal unit. For example, when H was born full term at 6lb 7oz, despite a few complications during pregnancy he seemed to be a healthy little boy. Two hours later, he was rushed to the neonatal unit with breathing difficulties. It transpired he had pneumonia, he was moved to intensive care and we were warned he may be unable to breathe for himself. In the space of just six hours we went from the thrill and joy of meeting our beautiful son to, the terror and fear of the unknown. We went from cuddling and kissing his tiny face, marvelling at the miracle of new life, to watching him struggle for breath in an incubator, covered in tubes and wires. We were still receiving congratulatory text messages in response to the early morning announcements we had made. Our precious little child should have been dressed in his new babygro, getting cuddles and kisses from his mummy, daddy and big brother, but instead he lay naked, vulnerable, out of reach, behind glass, too poorly and frail to enjoy those early days with his family. And how did we cope with that unexpected setback? I genuinely have no idea. I was numb, exhausted and in shock. I barely remember those days. You have absolutely no concept of time or ‘real life’ when you spend every waking minute in hospital. It is a surreal existence. But we got through it. We were the lucky ones. We took our baby home. Further setbacks came when Little H was six months old and although I had suspected for some time that he wasn’t developing normally, it was still heartbreaking when they decided to investigate further on account of his head failing to grow adequately. X-rays, blood tests, MRI’s followed. I coped with this setback by googling everything, trawling the internet for all the possible explanations, preparing myself for the worst possible outcome while praying for the opposite. My husband, Mr M coped by almost denying there was a problem. Not so much burying his head in the sand, but explaining away the delays – he was just a bit slower, his brother had been particularly able, he spent time in the neonatal unit. The lack of head growth wasn’t as easy to explain, but perhaps it was because he had been so ill through reflux? Rather than angering me, his denials helped. I think we worked well together – I kept him realistic; he kept me positive. Worse was to come in the form of the results. On the same day we found his brain was underdeveloped, we also discovered he had a rare chromosome abnormality. This was a devastating blow. His chromosomes couldn’t be fixed. My coping strategy again was to go to the internet and try and diagnose the child myself. Mr M’s was to look at the positives once again. I found a great charity – Unique – who sent me information and supported me. Feeling proactive and like I was doing something helped me cope. So I contacted as many agencies as possible – Early support teachers, KIDS, hoping that by the time we reached the top of their waiting list I wouldn’t actually need them. We did though! I don’t think we ever had time to sit down and really process the information. 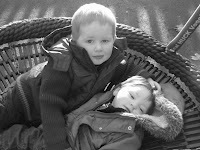 I remember being particularly upset that Little H might not be able to go to the same school as his brother Cheeky who is just 14 months older than him, but other than that we barely had a chance to consider the future before the next major setback just a couple of weeks later. He was pure blue when I found him. I have never been more terrified in my entire life. I’d like to say I’ve never again been as terrified, but H has terrified me regularly by performing the same trick repeatedly since then. At least once a week, but sometimes as often as 10 times in 12 hours. I don’t just mean he has long pauses in his breathing. He literally just stops! Tests and questions. Tests and questions. Four months later, these episodes were eventually diagnosed as epilepsy. I worried that his brain was just forgetting to tell him to breathe – it wasn’t doing a great deal else successfully – and was told that whilst in most people, the body’s first and most natural instinct is to breathe, with H this might not necessarily be the case; there was every possibility that these episodes were in fact life threatening! So when the epilepsy diagnosis came, it was what I had been hoping for, wishing for, praying for. Surely the right treatment would help. And at first everyone was positive – “don’t worry about the fact he doesn’t breathe, seizures aren’t that serious until they reach 30 minutes”. We adjusted to the new diagnosis and tried to live our lives. It didn’t even seem to be a setback as such, at first. And then, last summer, the seizures just kept on coming! The medications weren’t helping and an unfortunate run of illnesses meant we spent much of the summer in the High Dependency Unit. And it was here that the setbacks came thick and fast; not allowing time to breathe, never mind time to process or deal with or cope with the new information. First was the look of panic when a nurse witnessed his seizures – I’d described them repeatedly but it appears I hadn’t been doing them justice. She told me later, she had been terrified and had worried about him all day after her shift had ended. Then was the move to HDU. Then the arrival of the paediatrician who spoke about the need to sedate him heavily with an unusually large dose of an anti-epileptic- almost in an attempt to reset his brain and stop the seizures, like powering off a computer. Then was the “big talk” with the consultant, we were taken from HDU to a private room (Alarm bells should have been ringing here). Mr M and I sat while our Consultant Paediatrician explained the risk of SUDEP (Sudden unexplained death in epilepsy) but that not only was H at an increased risk of this but that his seizures themselves posed an increased risk because during his stay in hospital it had become apparent that not only did his oxygen saturation levels drop dangerously low during a seizure (Obvious by the colour change but sometimes recording as low as 7%) but that this also affected his heart rate causing it to drop. Basically, within the space of just over 3 minutes, it is possible for H to go into respiratory and cardiac arrest. So how do you deal with a setback like that? Tears. More tears. He was so poorly at that time that we genuinely couldn’t concentrate on the bigger picture. He was so heavily sedated we could barely recognise him. There was hardly a glimmer of life there. So we concentrated on getting through those days in hospital. And when we got home and had time to think, the next big bombshell hit. We were assigned a palliative care nurse. Palliative care? I remember that from when my Dad was dying. Palliative is not a good word! I realise now that we had, in part had this explained to us, but I hadn’t/couldn’t/wouldn’t hear(d). I rang the consultant to confirm – hoping there had been some mistake. Nope. On account of his epilepsy, his vulnerability to illness and infection and the fact H was so physically delayed it was unlikely he would reach adulthood. It wouldn’t be surprising if he didn’t reach secondary school age. And that setback? How have we coped with that? If anything, it has taught me to appreciate what we have got; that things have been, could be, and probably will be much worse! I’m not sure how we have got through it, but at the end of the day, Mr M and I have two wonderful, beautiful sons who we love and who need us. Regardless of the challenges ahead we just have to keep on getting out of bed and facing the day. Eventually it becomes a new kind of normal. The setbacks and difficulties aren’t easy, but as long as I remember how much I love my boys then I will get up and fight another day. You have written what could have been such a negative and sad post with a sense of positivity and hope. There is nothing I can say so I'm sending you a BIG HUG. Agreeing with Jane - this is a beautiful post. For a Little Mamma you have a lot of strength. Thanks Jane, Barbara, Blue Sky and Bree. Jane, I am attempting to be more positive about things instead of getting wrapped up in how hard it can be. You said before about seeinng things as a challenge rather than a problem - it's not always easy to do, but I'm getting there. Blue Sky - I always like to read your comments as it is inspiring to know someone that much further along the line - who have been where we are and got through it. Thanks Barbara and Bree - such sweet things to say. I read your post over at Special Saturday and I just had to read it again. You are so right.. you just have to remember how much you love your boys and regardless of any challenges you wouldn't want to be without them. It is very hard to come to terms with the loss of your expectations and dreams... but you know what.. life gets easier and you will always love your boys no matter what. Thank you Jane, that is a lovely thing to say, especially since I find you so inspirational yourself.